Brand-new adventures set in the world of Rot & Ruin! Written by New York Times best-selling author and multiple Bram Stoker award-winner, Jonathan Maberry, this all-new storyline continues events from the award-winning series of novels. We meet Benny, Nix, Lilah, and Chong as they travel through the Sierra Nevada mountains just one faltering step ahead of zombie hordes and one giant leap behind the plane flying through the sky that set them on their journey of discovery. JONATHAN MABERRY is a New York Times best-selling and multiple Bram Stoker Award-winning suspense author, editor, comic book writer, magazine feature writer, playwright, content creator, and writing teacher/lecturer. He was named one of Today’s Top Ten Horror Writers. His books have been sold to more than two-dozen countries. Among his numerous book and comic credits are the shared world anthologies V-Wars: Shockwaves and V-Wars: Night Terrors; the X-Files short story anthologies The Truth Is Out There, Trust No One, and Secret Agendas; the V-Wars comic series; and the comic series adaptation of his zombie novel Rot & Ruin; all from IDW Publishing. 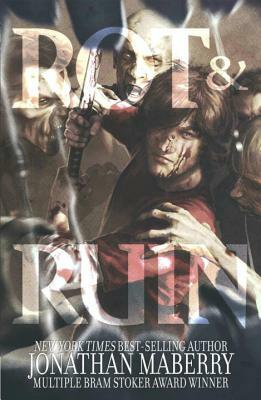 "Teens & fans of The Walking Dead will love ROT & RUIN: WARRIOR SMART" --Amy Taylor, Librarian at Lee's Summit West High School in Lee's Summit, Missouri.